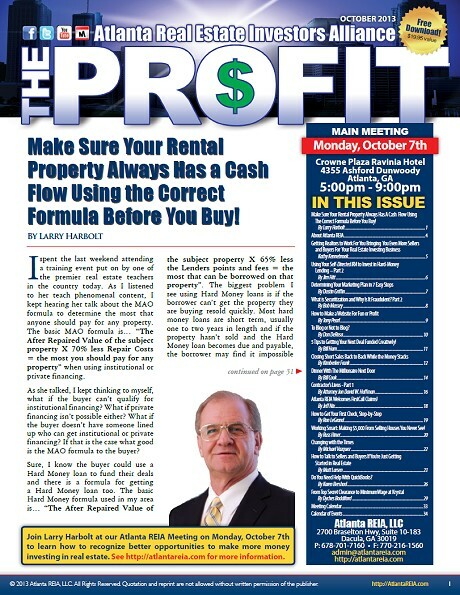 Make Sure Your Rental Property Always Has a Cash Flow Using the Correct Formula Before You Buy! 5 Tips to Getting Your Next Deal Funded Creatively! Closing Short Sales Back to Back While the Money Stacks! By Jon David Huffman, Esq. Atlanta REIA Welcomes FirstCall Claims! Working Smart: Making $5,000 From Selling Houses You Never See!